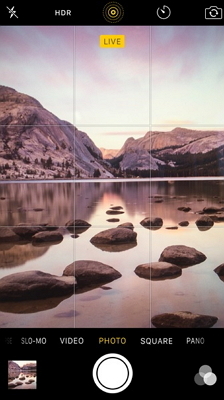 Apple introduced Live Photos from its iPhone 6s series. A Live Photo is a procedure where the camera captures a second of audio and video while pressing the shutter button. The capturing period is before and after. The outcome is a moving picture and has a little frame rate. Nonetheless, sharing the moving photos unlike still images is an interesting aspect. It is possible for you to capture live photos if you are using iPhone 6s, 6s Plus, 7, and 7 Plus on iOS 11.3 or earlier. Apple provided the opportunity to create Live Photos for both rear and front-facing cameras. Part 1. How to Take Live Photos on iPhone? Part 2. How to Turn Your Live Photos into GIFs? Part 3. 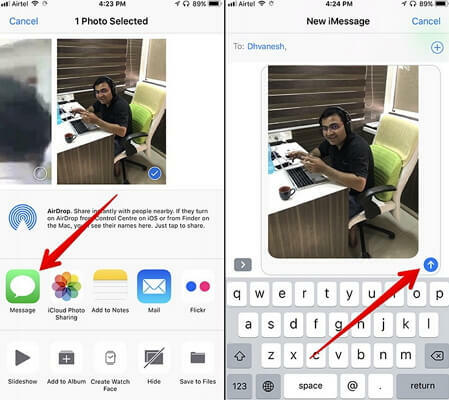 How to Send Live Photos as GIFs on iPhone? To capture a live photo on your iPhone, you will have to enable Live Photos feature after launching the Camera application. To enable the feature, you have to tap the bull's eye icon that appears at the top of the screen. You will know that the application is in Live Photos mode, as it turns yellow when active. Once you press the shutter button, the application will capture one second of audio and video before and after. It will then process the image, which you will observe it as a moving picture. Now that you hold knowledge on how to create Live Photos in your iPhone, it is time to turn them into GIFs. 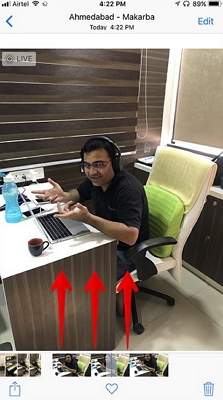 GIF stands for Graphics Interchange Format that allows a user to view Live Photos or GIFs without installing any additional application. Once you have a good collection of Live Photos in your photo library, you can proceed with the steps below in order to turn them into GIFs. 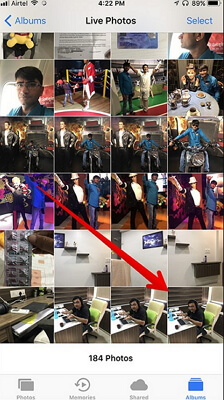 Step 1: Launch the Photos application on your iPhone. 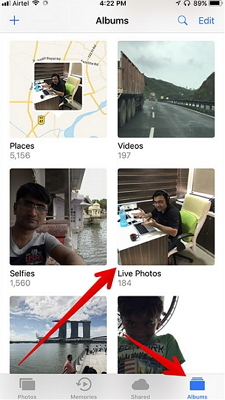 From the available list, choose Live Photos album. Step 2: From the available pictures, choose the one that you wish to create as a GIF. Step 3: Once the selected image appears on the display, swipe up on the picture. 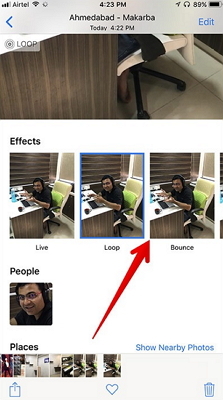 Step 4: Swiping up will provide you with four options - Live, Loop, Bounce, and Long Exposure. You can pick any of the effects from the following options. Step 5: Upon applying the effect, you have successfully turned the Live Photo into a GIF. 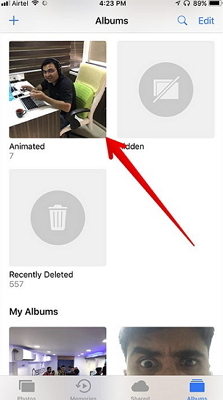 You can gain access to the same from the animated folder in the photo library. Part 3. How to Send Live Photos as GIFs on iPhone (iOS 11.3 included)? Open the Photos application on your iPhone/iPad. Click on the Album’s tab at the bottom. From the available list, choose Animated album. From the images available in the folder, select the animated image that you wish to send as a message. Tap the share button that is present at the down left corner of the screen. You now have the authority to send it through your favorite medium. You can use emails, messenger services such as WhatsApp, Snapchat, Instagram, and other third-party applications. For example, we will be showing you how you can share it via messages. As you have selected the share button, you will be able to view the medium through which you can send the image. From the options, choose Message. You can enter the recipient name and tap the send button. As you possess knowledge about Live Photos, creating Live Photos and turning them into GIFs on iPhone/iPad with iOS 11.3 or earlier, it is time for you to capture beautiful moments in your life. Rather than being still images, the moving photos create an impact on the viewer. In addition to the creation, you further gain the possibility to share the GIFs using different social media platforms. You can also send the animated picture as a message from your iPhone or iPad to an individual who is capable of viewing the same.